Oh, the stress of being a good holiday host. It’s so hard for a host to relax when there are so many things to worry about: Will my guests find the place alright? Will they like the food I am serving? Will they be viciously attacked and eaten? And, as Martha Stewart will tell you, few things will put a damper on the holiday festivities faster than your guests being ambushed, dragged away and brutally consumed. But, when you are hosting winter birds at your backyard bird feeder, uninvited hawks can make it a real possibility. Yes, a bird bath can quickly turn into a blood bath when a Sharp-shinned hawk decides to set up camp and take advantage of the all-you-can-eat bird buffet that you have unwittingly provided. Although there are about 50 different species of accipiters worldwide, there are only three species found in North America. Those three species are the Sharp-shinned hawk (Accipiter striatus), the Cooper’s hawk (Accipiter cooperii), and the Goshawk (Accipiter gentilis). All three species of North American accipiters are closely related, very similar to each other in appearance, and notoriously difficult for amateur bird watchers to discern from each other. The three species differ from each other most notably in size, with the Sharpie being the smallest (pigeon-sized), the Goshawk being twice that size, and the Cooper’s Hawk in the middle. 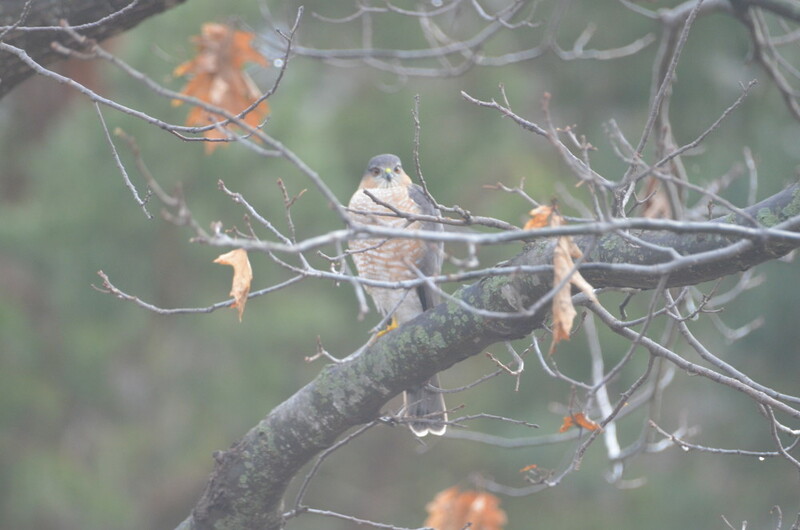 Smaller birds can account for up to 90% of an accipiter’s diet. This is why the accipiter hawks are generally known to ornithologists as the “sparrow hawks.” The British are quick to point out that the European Sparrow Hawk (Accipiter nisus) is the only accipiter which has the distinction of being the one true sparrow hawk. Not to be outdone, we Americans long ago proclaimed the American Kestrel to be the sparrow hawk (apparently unconcerned that the kestrel is really a falcon and doesn’t actually eat that many sparrows). The Brits have never forgiven us for this and, to this day, they still occasionally lash out at the world by creating and exporting dreadful pop musical groups like the Pet Shop Boys and the Spice Girls. Accipiters occupy a variety of woodland habitats all across North America where they use quick bursts of speed and agility to chase their prey through obstacle courses of trees and shrubs. Despite their agility, studies have found that up to 25% of the birds in some accipiter populations have broken or fractured collar bones from hunting-related collisions with trees. Being the smallest of the North American accipiters, Sharp-shinned hawks feed on the smallest songbirds and will readily take advantage of residential bird feeders if they are available. Experienced hawks can even learn to take full advantage of the urban environment, frightening and herding panicked songbirds into the mirror-like reflection of a nearby window, then snatching the stunned victims from the ground. However, inexperienced hawks often fall victim to the very same illusion when they themselves mistake the reflected image of a group of birds at a feeder for the real thing. Many bird enthusiasts are uncomfortable with the idea of a hawk preying on their songbirds. After all, we love to watch the birds fill up on seed and fly away from the feeder, but we usually like to see them fly away under their own power. When we see them clutched in the talons of another bird, we sometimes feel like accessories to a crime, and “bird feeding” takes on a whole new meaning. Keep in mind, however, that in the long run these hawks do a valuable service to the songbird species on which they prey. They test the songbirds for alertness and agility, culling out the weak and unfit, strengthening the genetics of the remaining population. Plus, there’s something very gratifying in watching a hawk take out the mourning dove that’s been waking you up at 5 AM for the last few weeks.